Are tomatillos available here in DR? Tomatillos are not a traditional fruit here. At one point there was an 'exotic' range being sold at Supermercados Nacional that included tomatillos/tree tomatoes as well as other non-traditional fruit like persimmons - have a look there. I never saw them in a Supermercado, but I think salsa verde may be available. La Costena is the brand here that is ok RD$110 for 475ml. It has some stuff (chemicals) in it that is not so good but overall a good "warm" flavor. Excellent flavor combination with ground pork empanadas. So basically, tomatillos do not seem to be available here. YES they are (Chiri's picture is right)! I buy them all the time in Supermercado El Pola; a pack of 8 is around $50 pesos. I always get asked what they are in the office, none of my coworkers knew what they were. They are delicious! So what were you looking for. 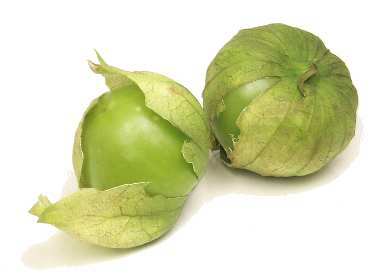 Tomatillos or Tamarillos? I think he was looking for the green ones. Now I'm no longer sure whether tamarillos/tomates de arbol are sometimes called tomatillos (in Ecuador, where I first came across them) or whether I was confused. What does it say on the label, juanita?